It is often claimed by anti-biblical creationists that believing the literal Creation account as described in the first 11 chapters of Genesis is the same as believing in pseudosciences like alchemy, astrology, and even a flat Earth. The reason they say this is because some galaxies are billions of light-years distant from us in the universe, so how could light travel to Earth in the 6 thousand years available since the Creation? Surely light could only travel 6000 light-years in 6000 years. That is not even outside our galaxy. This is then called a light-travel-time problem. But the most accepted model describing the origin of the universe, the hot big bang inflation model has a light-travel-time problem. It is called the horizon problem. The horizon problem can be understood best from the illustration (left). First imagine two points on the last scattering surface (LSS) of the big bang fireball that were initially much closer together. We now allegedly see radiation in the Cosmic Microwave Background (CMB) coming from these points on that putative source 13.8 billion years after the universe has expanded by an expansion factor of about 1100. 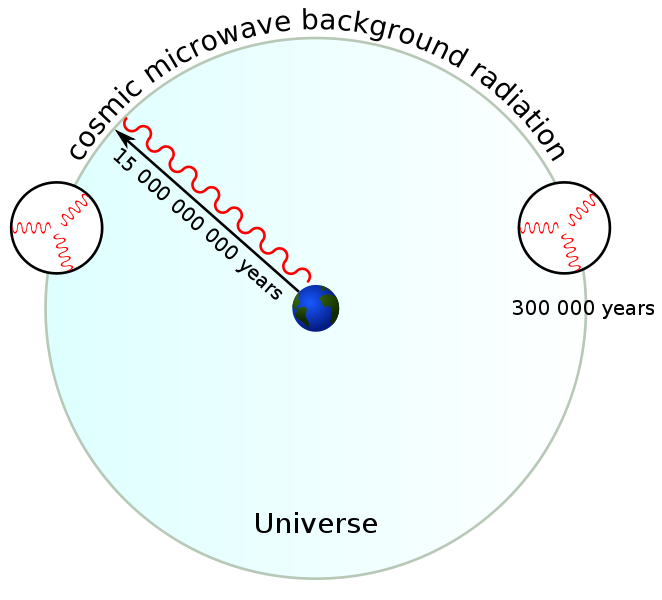 According to the theory, by the time the radiation gets to our vicinity in the universe it has cooled by the same expansion factor, and we measure its temperature in the CMB at almost a uniform temperature of 2.72548±0.00057 K (-270 °C), which is uniform to about 1 part in 100,000. That is, it is at the same temperature for all directions in space. It is extremely uniform. So how is that possible? The source of the light we supposedly see today came from the LSS when the universe was only 300 thousand years old. In that time light would have only reached as far as the smaller circles shown in the diagram. The two points indicated on the diagram would not have been able to contact each other because their spheres of causality do not overlap. These are represented by the circles drawn around these points. This is the distance light would traveled at constant speed of light in the available time. So the two points could never have exchanged radiation nor come into thermal equilibrium. Thus they could not become equal in temperature. This is true for all such points. Hence the horizon problem is a light-travel-time problem. Initial exponentially rapid inflation was proposed to solve this problem, as well as some others. Inflation is the proposed extremely rapid exponential expansion of the early universe by a factor of at least 1078 in volume, driven by a negative-pressure vacuum energy density. It is proposed to have lasted from 10−36 seconds after the big bang to sometime between 10−33 and 10−32 seconds, when it smoothly came to a stop. The idea is meant to help because if the regions that we now see the radiation coming from were initially in causal contact, in the same small patch of space, meaning they were exchanging energy and hence in thermal equilibrium, but were then stretched apart much faster that light speed, during the inflation episode. They would lose that causal contact and hence create the apparent horizon problem now. This means of course that the points on the fireball, that represent the visible universe at the current epoch, were at almost uniform temperature before the inflation period for them to be at such uniform temperature after. This is an essential initial condition, a big assumption. The latter relates to the correct quantum gravity theory that does not yet exist. Also how and why did inflation start and how and why did it stop? What is the hypothetical ‘inflaton’ field or particle that caused it? More unknowns to solve unknowns. Seems like a giant fudge factor to me. This hypothetical inflation period supposedly solves other problems like the flatness problem, the smoothness problem and the magnetic-monopole problem but to solve the horizon problem superluminal light has even been proposed– light travelling much faster in the past than today. The latter been proposed as an alternate solution to these cosmological problems and others without invoking cosmic inflation. Here’s the irony: Creationists in the past have proposed superluminal light speeds to solve the apparent light-travel-time problem in their cosmogony (origin of the Universe). When they did that it was decried as pseudo-science, but now the mainstream have suggested it to solve their problems. And it is now considered to be respectable science. This is science accomplished by the majority opinion. They have a worldview that is anti-biblical and you can see what it leads to. Even though they have many problems and propose unknowns like inflation to solve their unknowns (problems) they can’t see that their model needs to be discarded. The biblical worldview makes much more sense. God is the uncreated first cause Who created the heavens and the Earth, for His own glory, and He did it just as He said. Update: June 20th, 2014, the BICEP2 Collaboration team wrote in their peer-reviewed paper in Physical Review Letters that they may have been wrong in their claimed detection of the inflation epoch. It all comes down to the Planck satellite analysis on the same region of space at the same wavelengths. See “The authors of the claimed biggest astrophysics discovery of the century admit they may have been wrong.” But then those results were published 23 September 2014 with a headline Epic Big Bang Discovery Might Just Be Space Dust. Read Inflation epoch hopes dashed again. Still going through Brian Cox & Jeff Forshaw’s book regarding Why Does E=mc^2? (and Why Should We Care?). Though it’s secular explanation, would like to see how they try to explain light travel in the universe. Was thinking that Lorentz factor could be part of it but the more I read the more agnostic I become towards it. I remember reading someone experimenting at the University of Toronto to measure the “one way speed of light”. Am very skeptical whether this could ever be done. Feynman did state that it was difficult to explain light in a classical manner due to its properties. What are your thoughts John? The one-way-speed of light, fundamentally, cannot be measured. It always requires a second light signal to synchronize the second clock. In my bog entry (http://johnhartnett.org/2013/12/26/how-do-we-see-distant-galaxies-in-a-6000-year-old-universe) I discuss this point. Because it cannot be measured it can be arbitrarily chosen without violation of any physics. Therefore it is really chosen by convention and we are free to choose, like Jason Lisle has done in his ASC model.